The Robert E. Lee monument is removed at Lee Circle in New Orleans, Friday, May 19, 2017. The Robert E. Lee monument is one of 4 monuments voted to be removed in December 2015 by New Orleans City Council. The other three monuments have already been removed. The Confederate statue of Robert E. Lee is lifted from its pedestal in Lee Circle in New Orleans Friday, May 19, 2017. A hook hangs over the head of the statue of Robert E. Lee at Lee Circle in New Orleans, Friday, May 19, 2017. The Robert E. Lee monument is one of 4 monuments voted to be removed in December 2015 by New Orleans City Council. The other three monuments have already been removed. Workers prepare to remove the Robert E. Lee monument at Lee Circle in New Orleans, Friday, May 19, 2017. The Robert E. Lee monument is one of 4 monuments voted to be removed in December 2015 by New Orleans City Council. The other three monuments have already been removed. A man walks in front of the crane before the removal of the statue of Robert E. Lee at Lee Circle in New Orleans, Friday, May 19, 2017. The Robert E. Lee monument is one of 4 monuments voted to be removed in December 2015 by New Orleans City Council. The other three monuments have already been removed. A worker climbs down from the crane before the removal of Robert E. Lee at Lee Circle in New Orleans, Friday, May 19, 2017. The Robert E. Lee monument is one of 4 monuments voted to be removed in December 2015 by New Orleans City Council. The other three monuments have already been removed. Robert E. Lee peaks from the top of trees on St. Charles Avenue at Lee Circle in New Orleans, Friday, May 19, 2017. The Robert E. Lee monument is one of 4 monuments voted to be removed in December 2015 by New Orleans City Council. The other three monuments have already been removed. Works tie a rope around the leg of the Robert E. Lee monument at Lee Circle in New Orleans, Friday, May 19, 2017. The Robert E. Lee monument is one of 4 monuments voted to be removed in December 2015 by New Orleans City Council. The other three monuments have already been removed. People watch from the Nation WWII Museum as workers prepare to remove the monument of Robert E. Lee at Lee Circle in New Orleans, Friday, May 19, 2017. The Robert E. Lee monument is one of 4 monuments voted to be removed in December 2015 by New Orleans City Council. The other three monuments have already been removed. Perhaps the last sunrise is seen over the Confederate Robert E. Lee monument, erected in 1884 by ex-Confederates and white Southerners, in New Orleans, La. Friday, May 19, 2017. The New Orleans City Council voted to remove the statue 16 months ago in Dec. 2015 and three other monuments that have already been removed including a statue of Confederate Jefferson Davis, Confederate P.G.T. Beauregard, and the white supremacist Battle of Liberty Place White League monument. The Lee statue was first unveiled during the Jim Crow racial segregation era with Davis and Beauregard in attendance, and also two daughters of General Lee. The monument was placed in what once was Tivoli Circle or Place du Tivoli. New Orleans only spent 15 months in the Confederacy and spent the majority of the Civil War under Union control when the city was captured in 1862 with zero casualties and Tivoli Circle was used as a camp for Union soldiers during the war. 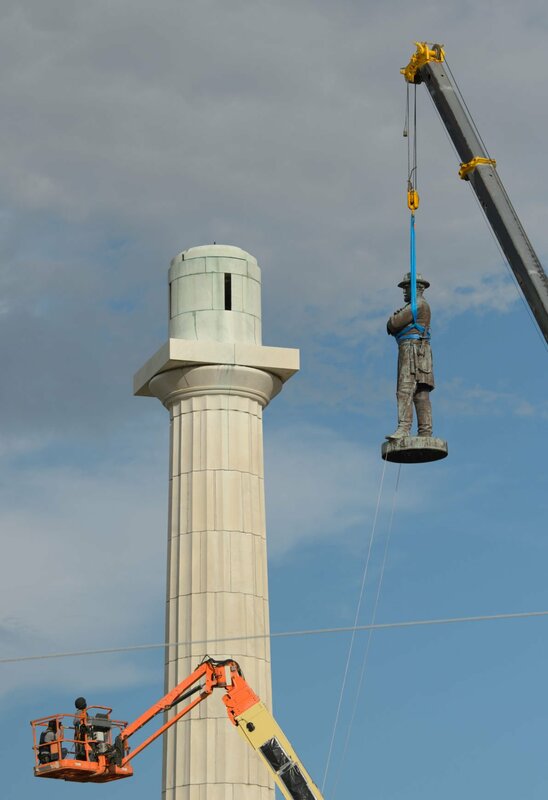 After gazing over the changing face of New Orleans for 133 years from atop a 68-foot column in the prominent circle that has borne his name, the statue of Gen. Robert E. Lee was lifted off Friday evening, the final step in a plan New Orleans has pursued since 2015 to remove statues to Confederate officials and a white militia from public places. Swaying slightly as it was lowered to the ground by a crane that had been moved into Lee Circle, the statue was placed on a flatbed truck for transport to a storage facility. Workers drive away with th Confederate Robert E. Lee statue, erected in 1884 by ex-Confederates and white Southerners, in New Orleans, La. Friday, May 19, 2017. The New Orleans City Council voted to remove the statue 16 months ago in Dec. 2015 and three other monuments that have already been removed including a statue of Confederate Jefferson Davis, Confederate P.G.T. Beauregard, and the white supremacist Battle of Liberty Place White League monument. The Lee statue was first unveiled during the Jim Crow racial segregation era with Davis and Beauregard in attendance, and also two daughters of General Lee. The monument was placed in what once was Tivoli Circle or Place du Tivoli. New Orleans only spent 15 months in the Confederacy and spent the majority of the Civil War under Union control when the city was captured in 1862 with zero casualties and Tivoli Circle was used as a camp for Union soldiers during the war. The sunsets by the Confederate Robert E. Lee monument, erected in 1884 by ex-Confederates and white Southerners, in New Orleans, La. Thursday, May 18, 2017. The New Orleans City Council voted to remove the statue 16 months ago in Dec. 2015 and three other monuments that have already been removed including a statue of Confederate Jefferson Davis, Confederate P.G.T. Beauregard, and the white supremacist Battle of Liberty Place White League monument. The Lee statue was first unveiled during the Jim Crow racial segregation era with Davis and Beauregard in attendance, and also two daughters of General Lee. The monument was placed in what once was Tivoli Circle or Place du Tivoli. New Orleans only spent 15 months in the Confederacy and spent the majority of the Civil War under Union control when the city was captured in 1862 with zero casualties and Tivoli Circle was used as a camp for Union soldiers during the war. Isidore Newman School sophomore Jack Gentry tries to reason with Confederate supporter Jenna Bernstein, from Florida, at the Robert E. Lee monument, erected in 1884 by ex-Confederates and white Southerners, in New Orleans, La. Thursday, May 18, 2017. The New Orleans City Council voted to remove the statue 16 months ago in Dec. 2015 and three other monuments that have already been removed including a statue of Confederate Jefferson Davis, Confederate P.G.T. Beauregard, and the white supremacist Battle of Liberty Place White League monument. The Lee statue was first unveiled during the Jim Crow racial segregation era with Davis and Beauregard in attendance, and also two daughters of General Lee. The monument was placed in what once was Tivoli Circle or Place du Tivoli. New Orleans only spent 15 months in the Confederacy and spent the majority of the Civil War under Union control when the city was captured in 1862 with zero casualties and Tivoli Circle was used as a camp for Union soldiers during the war. People gather in front of the Confederate Robert E. Lee monument at Lee Circle in New Orleans, La. Thursday, May 18, 2017. The New Orleans City Council voted to remove the statue 16 months ago in Dec. 2015 and three other monuments that have already been removed including a statue of Confederate Jefferson Davis, Confederate P.G.T. Beauregard, and the white supremacist Battle of Liberty Place White League monument. A man is arrested after hopping police barricades and jumping on base of Robert E. Lee statue around near midnight at the Robert E. Lee monument, erected in 1884 by ex-Confederates and white Southerners, in New Orleans, La. Thursday, May 18, 2017. The New Orleans City Council voted to remove the statue 16 months ago in Dec. 2015 and three other monuments that have already been removed including a statue of Confederate Jefferson Davis, Confederate P.G.T. Beauregard, and the white supremacist Battle of Liberty Place White League monument. The Lee statue was first unveiled during the Jim Crow racial segregation era with Davis and Beauregard in attendance, and also two daughters of General Lee. The monument was placed in what once was Tivoli Circle or Place du Tivoli. New Orleans only spent 15 months in the Confederacy and spent the majority of the Civil War under Union control when the city was captured in 1862 with zero casualties and Tivoli Circle was used as a camp for Union soldiers during the war. Protestors gather around the Robert E. Lee monument, erected in 1884 by ex-Confederates and white Southerners, in New Orleans, La. Thursday, May 18, 2017. The New Orleans City Council voted to remove the statue 16 months ago in Dec. 2015 and three other monuments that have already been removed including a statue of Confederate Jefferson Davis, Confederate P.G.T. Beauregard, and the white supremacist Battle of Liberty Place White League monument. The Lee statue was first unveiled during the Jim Crow racial segregation era with Davis and Beauregard in attendance, and also two daughters of General Lee. The monument was placed in what once was Tivoli Circle or Place du Tivoli. New Orleans only spent 15 months in the Confederacy and spent the majority of the Civil War under Union control when the city was captured in 1862 with zero casualties and Tivoli Circle was used as a camp for Union soldiers during the war. Opposing protestors come to an understanding at the Robert E. Lee monument, erected in 1884 by ex-Confederates and white Southerners, in New Orleans, La. Thursday, May 18, 2017. The New Orleans City Council voted to remove the statue 16 months ago in Dec. 2015 and three other monuments that have already been removed including a statue of Confederate Jefferson Davis, Confederate P.G.T. Beauregard, and the white supremacist Battle of Liberty Place White League monument. The Lee statue was first unveiled during the Jim Crow racial segregation era with Davis and Beauregard in attendance, and also two daughters of General Lee. The monument was placed in what once was Tivoli Circle or Place du Tivoli. New Orleans only spent 15 months in the Confederacy and spent the majority of the Civil War under Union control when the city was captured in 1862 with zero casualties and Tivoli Circle was used as a camp for Union soldiers during the war. Opposing protestors hug at the Robert E. Lee monument, erected in 1884 by ex-Confederates and white Southerners, in New Orleans, La. Thursday, May 18, 2017. The New Orleans City Council voted to remove the statue 16 months ago in Dec. 2015 and three other monuments that have already been removed including a statue of Confederate Jefferson Davis, Confederate P.G.T. Beauregard, and the white supremacist Battle of Liberty Place White League monument. The Lee statue was first unveiled during the Jim Crow racial segregation era with Davis and Beauregard in attendance, and also two daughters of General Lee. The monument was placed in what once was Tivoli Circle or Place du Tivoli. New Orleans only spent 15 months in the Confederacy and spent the majority of the Civil War under Union control when the city was captured in 1862 with zero casualties and Tivoli Circle was used as a camp for Union soldiers during the war. Police talk with protestors gathered around the Robert E. Lee monument, erected in 1884 by ex-Confederates and white Southerners, in New Orleans, La. Friday, May 19, 2017. The New Orleans City Council voted to remove the statue 16 months ago in Dec. 2015 and three other monuments that have already been removed including a statue of Confederate Jefferson Davis, Confederate P.G.T. Beauregard, and the white supremacist Battle of Liberty Place White League monument. The Lee statue was first unveiled during the Jim Crow racial segregation era with Davis and Beauregard in attendance, and also two daughters of General Lee. The monument was placed in what once was Tivoli Circle or Place du Tivoli. New Orleans only spent 15 months in the Confederacy and spent the majority of the Civil War under Union control when the city was captured in 1862 with zero casualties and Tivoli Circle was used as a camp for Union soldiers during the war. Protestors gather around the Robert E. Lee monument, erected in 1884 by ex-Confederates and white Southerners, in New Orleans, La. Friday, May 19, 2017. The New Orleans City Council voted to remove the statue 16 months ago in Dec. 2015 and three other monuments that have already been removed including a statue of Confederate Jefferson Davis, Confederate P.G.T. Beauregard, and the white supremacist Battle of Liberty Place White League monument. The Lee statue was first unveiled during the Jim Crow racial segregation era with Davis and Beauregard in attendance, and also two daughters of General Lee. The monument was placed in what once was Tivoli Circle or Place du Tivoli. New Orleans only spent 15 months in the Confederacy and spent the majority of the Civil War under Union control when the city was captured in 1862 with zero casualties and Tivoli Circle was used as a camp for Union soldiers during the war. A woman, right, faces off with a pro-monument supporter after taking a confederate flag from one of the pro-monument supporters near the Robert E. Lee monument, erected in 1884 by ex-Confederates and white Southerners, in New Orleans, La. Friday, May 19, 2017. The New Orleans City Council voted to remove the statue 16 months ago in Dec. 2015 and three other monuments that have already been removed including a statue of Confederate Jefferson Davis, Confederate P.G.T. Beauregard, and the white supremacist Battle of Liberty Place White League monument. The Lee statue was first unveiled during the Jim Crow racial segregation era with Davis and Beauregard in attendance, and also two daughters of General Lee. The monument was placed in what once was Tivoli Circle or Place du Tivoli. New Orleans only spent 15 months in the Confederacy and spent the majority of the Civil War under Union control when the city was captured in 1862 with zero casualties and Tivoli Circle was used as a camp for Union soldiers during the war. A pro-monument supporter kicks the van of a woman after she took a confederate flag from one of the pro-monument supporters near the Robert E. Lee monument, erected in 1884 by ex-Confederates and white Southerners, in New Orleans, La. Friday, May 19, 2017. The New Orleans City Council voted to remove the statue 16 months ago in Dec. 2015 and three other monuments that have already been removed including a statue of Confederate Jefferson Davis, Confederate P.G.T. Beauregard, and the white supremacist Battle of Liberty Place White League monument. The Lee statue was first unveiled during the Jim Crow racial segregation era with Davis and Beauregard in attendance, and also two daughters of General Lee. The monument was placed in what once was Tivoli Circle or Place du Tivoli. New Orleans only spent 15 months in the Confederacy and spent the majority of the Civil War under Union control when the city was captured in 1862 with zero casualties and Tivoli Circle was used as a camp for Union soldiers during the war. A woman, left, faces off with a pro-monument supporter after taking a confederate flag from one of the pro-monument supporters near the Robert E. Lee monument, erected in 1884 by ex-Confederates and white Southerners, in New Orleans, La. Friday, May 19, 2017. The New Orleans City Council voted to remove the statue 16 months ago in Dec. 2015 and three other monuments that have already been removed including a statue of Confederate Jefferson Davis, Confederate P.G.T. Beauregard, and the white supremacist Battle of Liberty Place White League monument. The Lee statue was first unveiled during the Jim Crow racial segregation era with Davis and Beauregard in attendance, and also two daughters of General Lee. The monument was placed in what once was Tivoli Circle or Place du Tivoli. New Orleans only spent 15 months in the Confederacy and spent the majority of the Civil War under Union control when the city was captured in 1862 with zero casualties and Tivoli Circle was used as a camp for Union soldiers during the war. A police officer draws his gun as a woman, right, moves forward in her van after taking the flag of a pro-monument supporter after at the Robert E. Lee monument, erected in 1884 by ex-Confederates and white Southerners, in New Orleans, La. Friday, May 19, 2017. The New Orleans City Council voted to remove the statue 16 months ago in Dec. 2015 and three other monuments that have already been removed including a statue of Confederate Jefferson Davis, Confederate P.G.T. Beauregard, and the white supremacist Battle of Liberty Place White League monument. The Lee statue was first unveiled during the Jim Crow racial segregation era with Davis and Beauregard in attendance, and also two daughters of General Lee. The monument was placed in what once was Tivoli Circle or Place du Tivoli. New Orleans only spent 15 months in the Confederacy and spent the majority of the Civil War under Union control when the city was captured in 1862 with zero casualties and Tivoli Circle was used as a camp for Union soldiers during the war. A police commander returns a flag to a pro-monument supporter after diffusing the situation and the woman who took the flag drives off in her van near the Robert E. Lee monument, erected in 1884 by ex-Confederates and white Southerners, in New Orleans, La. Friday, May 19, 2017. The New Orleans City Council voted to remove the statue 16 months ago in Dec. 2015 and three other monuments that have already been removed including a statue of Confederate Jefferson Davis, Confederate P.G.T. Beauregard, and the white supremacist Battle of Liberty Place White League monument. The Lee statue was first unveiled during the Jim Crow racial segregation era with Davis and Beauregard in attendance, and also two daughters of General Lee. The monument was placed in what once was Tivoli Circle or Place du Tivoli. New Orleans only spent 15 months in the Confederacy and spent the majority of the Civil War under Union control when the city was captured in 1862 with zero casualties and Tivoli Circle was used as a camp for Union soldiers during the war. Police close off Howard Ave. near the Robert E. Lee monument, erected in 1884 by ex-Confederates and white Southerners, in New Orleans, La. Friday, May 19, 2017. The New Orleans City Council voted to remove the statue 16 months ago in Dec. 2015 and three other monuments that have already been removed including a statue of Confederate Jefferson Davis, Confederate P.G.T. Beauregard, and the white supremacist Battle of Liberty Place White League monument. The Lee statue was first unveiled during the Jim Crow racial segregation era with Davis and Beauregard in attendance, and also two daughters of General Lee. The monument was placed in what once was Tivoli Circle or Place du Tivoli. New Orleans only spent 15 months in the Confederacy and spent the majority of the Civil War under Union control when the city was captured in 1862 with zero casualties and Tivoli Circle was used as a camp for Union soldiers during the war. Police tell the public to leave Lee Circle near the Robert E. Lee monument, erected in 1884 by ex-Confederates and white Southerners, in New Orleans, La. Friday, May 19, 2017. The New Orleans City Council voted to remove the statue 16 months ago in Dec. 2015 and three other monuments that have already been removed including a statue of Confederate Jefferson Davis, Confederate P.G.T. Beauregard, and the white supremacist Battle of Liberty Place White League monument. The Lee statue was first unveiled during the Jim Crow racial segregation era with Davis and Beauregard in attendance, and also two daughters of General Lee. The monument was placed in what once was Tivoli Circle or Place du Tivoli. New Orleans only spent 15 months in the Confederacy and spent the majority of the Civil War under Union control when the city was captured in 1862 with zero casualties and Tivoli Circle was used as a camp for Union soldiers during the war. Jenna Bernstein, right, gets a kiss from Charles Lee Hughes at the Confederate Robert E. Lee monument, erected in 1884 by ex-Confederates and white Southerners, in New Orleans, La. Thursday, May 18, 2017. The New Orleans City Council voted to remove the statue 16 months ago in Dec. 2015 and three other monuments that have already been removed including a statue of Confederate Jefferson Davis, Confederate P.G.T. Beauregard, and the white supremacist Battle of Liberty Place White League monument. The Lee statue was first unveiled during the Jim Crow racial segregation era with Davis and Beauregard in attendance, and also two daughters of General Lee. The monument was placed in what once was Tivoli Circle or Place du Tivoli. New Orleans only spent 15 months in the Confederacy and spent the majority of the Civil War under Union control when the city was captured in 1862 with zero casualties and Tivoli Circle was used as a camp for Union soldiers during the war. A worker is seen through the slit inside the Confederate Robert E. Lee monument, erected in 1884 by ex-Confederates and white Southerners, in New Orleans, La. Friday, May 19, 2017. The New Orleans City Council voted to remove the statue 16 months ago in Dec. 2015 and three other monuments that have already been removed including a statue of Confederate Jefferson Davis, Confederate P.G.T. Beauregard, and the white supremacist Battle of Liberty Place White League monument. The Lee statue was first unveiled during the Jim Crow racial segregation era with Davis and Beauregard in attendance, and also two daughters of General Lee. The monument was placed in what once was Tivoli Circle or Place du Tivoli. New Orleans only spent 15 months in the Confederacy and spent the majority of the Civil War under Union control when the city was captured in 1862 with zero casualties and Tivoli Circle was used as a camp for Union soldiers during the war. Police officers on motorcycles arrive to Lee Circle for the removal of Robert E. Lee in New Orleans, Friday, May 19, 2017. The Robert E. Lee monument is one of 4 monuments voted to be removed in December 2015 by New Orleans City Council. The other three monuments have already been removed. The crane burns rubber as it tries to backup on a ramp made at Lee Circle in New Orleans, Friday, May 19, 2017. The Robert E. Lee monument is one of 4 monuments voted to be removed in December 2015 by New Orleans City Council. The other three monuments have already been removed. Workers in a cherry picker with their faces covered and wearing helmets and body armor inspect the base of the Confederate Robert E. Lee monument at Lee Circle in New Orleans, La. Tuesday, May 18, 2017. The New Orleans City Council voted to remove the statue 16 months ago in Dec. 2015 and three other monuments that have already been removed including a statue of Confederate Jefferson Davis, Confederate P.G.T. Beauregard, and the white supremacist Battle of Liberty Place White League monument. Fire Chief Timothy McConnell walks around Lee Circle before the removal of the Robert E. Lee monument in New Orleans, Friday, May 19, 2017. The Robert E. Lee monument is one of 4 monuments voted to be removed in December 2015 by New Orleans City Council. The other three monuments have already been removed. People hang out in chairs on Howard Ave. as workers prepare to remove the Robert E. Lee monument at Lee Circle in New Orleans, Friday, May 19, 2017. The Robert E. Lee monument is one of 4 monuments voted to be removed in December 2015 by New Orleans City Council. The other three monuments have already been removed. Workers approach the Robert E. Lee statue in a cherry picker at Lee Circle in New Orleans, Friday, May 19, 2017. The Robert E. Lee monument is one of 4 monuments voted to be removed in December 2015 by New Orleans City Council. The other three monuments have already been removed. People sit in chairs on Howard Avenue and watch workers prepare to remove the Robert E. Lee monument at Lee Circle in New Orleans, Friday, May 19, 2017. The Robert E. Lee monument is one of 4 monuments voted to be removed in December 2015 by New Orleans City Council. The other three monuments have already been removed. Workers begin removing the Confederate Robert E. Lee monument, erected in 1884 by ex-Confederates and white Southerners, in New Orleans, La. Friday, May 19, 2017. The New Orleans City Council voted to remove the statue 16 months ago in Dec. 2015 and three other monuments that have already been removed including a statue of Confederate Jefferson Davis, Confederate P.G.T. Beauregard, and the white supremacist Battle of Liberty Place White League monument. The Lee statue was first unveiled during the Jim Crow racial segregation era with Davis and Beauregard in attendance, and also two daughters of General Lee. The monument was placed in what once was Tivoli Circle or Place du Tivoli. New Orleans only spent 15 months in the Confederacy and spent the majority of the Civil War under Union control when the city was captured in 1862 with zero casualties and Tivoli Circle was used as a camp for Union soldiers during the war. Take Em Down NOLA supporters watch as the Confederate Robert E. Lee monument, erected in 1884 by ex-Confederates and white Southerners, is taken down in New Orleans, La. Friday, May 19, 2017. The New Orleans City Council voted to remove the statue 16 months ago in Dec. 2015 and three other monuments that have already been removed including a statue of Confederate Jefferson Davis, Confederate P.G.T. Beauregard, and the white supremacist Battle of Liberty Place White League monument. The Lee statue was first unveiled during the Jim Crow racial segregation era with Davis and Beauregard in attendance, and also two daughters of General Lee. The monument was placed in what once was Tivoli Circle or Place du Tivoli. New Orleans only spent 15 months in the Confederacy and spent the majority of the Civil War under Union control when the city was captured in 1862 with zero casualties and Tivoli Circle was used as a camp for Union soldiers during the war. Workers hammer a wire for the crane to take down the Confederate Robert E. Lee statue, erected in 1884 by ex-Confederates and white Southerners, is taken down in New Orleans, La. Friday, May 19, 2017. The New Orleans City Council voted to remove the statue 16 months ago in Dec. 2015 and three other monuments that have already been removed including a statue of Confederate Jefferson Davis, Confederate P.G.T. Beauregard, and the white supremacist Battle of Liberty Place White League monument. The Lee statue was first unveiled during the Jim Crow racial segregation era with Davis and Beauregard in attendance, and also two daughters of General Lee. The monument was placed in what once was Tivoli Circle or Place du Tivoli. New Orleans only spent 15 months in the Confederacy and spent the majority of the Civil War under Union control when the city was captured in 1862 with zero casualties and Tivoli Circle was used as a camp for Union soldiers during the war. Special Operations Police watch the crowd during the take down of the Confederate Robert E. Lee statue, erected in 1884 by ex-Confederates and white Southerners, is taken down in New Orleans, La. Friday, May 19, 2017. The New Orleans City Council voted to remove the statue 16 months ago in Dec. 2015 and three other monuments that have already been removed including a statue of Confederate Jefferson Davis, Confederate P.G.T. Beauregard, and the white supremacist Battle of Liberty Place White League monument. The Lee statue was first unveiled during the Jim Crow racial segregation era with Davis and Beauregard in attendance, and also two daughters of General Lee. The monument was placed in what once was Tivoli Circle or Place du Tivoli. New Orleans only spent 15 months in the Confederacy and spent the majority of the Civil War under Union control when the city was captured in 1862 with zero casualties and Tivoli Circle was used as a camp for Union soldiers during the war. People watch crews make slow progress towards the removal of the statue of Gen. Robert E. Lee in from the The National WWII Museum in New Orleans, La. Friday, May 19, 2017. The statue of Gen. Robert E. Lee is the last of four confederate monuments removed from New Orleans public property. A crane removes the Confederate Robert E. Lee monument at Lee Circle in New Orleans, La. Friday, May 19, 2017. The New Orleans City Council voted to remove the statue 16 months ago in Dec. 2015 and three other monuments that have already been removed including a statue of Confederate Jefferson Davis, Confederate P.G.T. Beauregard, and the white supremacist Battle of Liberty Place White League monument. A crane removes the Confederate Robert E. Lee monument at Lee Circle in New Orleans, La. Friday, May 19, 2017. The New Orleans City Council voted to remove the statue in Dec. 2015 and three other monuments that have already been removed including a statue of Confederate Jefferson Davis, Confederate P.G.T. Beauregard, and the white supremacist Battle of Liberty Place White League monument. Workers take down the Confederate Robert E. Lee statue, erected in 1884 by ex-Confederates and white Southerners, in New Orleans, La. Friday, May 19, 2017. The New Orleans City Council voted to remove the statue 16 months ago in Dec. 2015 and three other monuments that have already been removed including a statue of Confederate Jefferson Davis, Confederate P.G.T. Beauregard, and the white supremacist Battle of Liberty Place White League monument. The Lee statue was first unveiled during the Jim Crow racial segregation era with Davis and Beauregard in attendance, and also two daughters of General Lee. The monument was placed in what once was Tivoli Circle or Place du Tivoli. New Orleans only spent 15 months in the Confederacy and spent the majority of the Civil War under Union control when the city was captured in 1862 with zero casualties and Tivoli Circle was used as a camp for Union soldiers during the war. Malcolm Suber of Take 'Em Down NOLA reacts as workers take down the Confederate Robert E. Lee statue, erected in 1884 by ex-Confederates and white Southerners, in New Orleans, La. Friday, May 19, 2017. The New Orleans City Council voted to remove the statue 16 months ago in Dec. 2015 and three other monuments that have already been removed including a statue of Confederate Jefferson Davis, Confederate P.G.T. Beauregard, and the white supremacist Battle of Liberty Place White League monument. The Lee statue was first unveiled during the Jim Crow racial segregation era with Davis and Beauregard in attendance, and also two daughters of General Lee. The monument was placed in what once was Tivoli Circle or Place du Tivoli. New Orleans only spent 15 months in the Confederacy and spent the majority of the Civil War under Union control when the city was captured in 1862 with zero casualties and Tivoli Circle was used as a camp for Union soldiers during the war. People watch as workers take down the Confederate Robert E. Lee statue, erected in 1884 by ex-Confederates and white Southerners, in New Orleans, La. Friday, May 19, 2017. The New Orleans City Council voted to remove the statue 16 months ago in Dec. 2015 and three other monuments that have already been removed including a statue of Confederate Jefferson Davis, Confederate P.G.T. Beauregard, and the white supremacist Battle of Liberty Place White League monument. The Lee statue was first unveiled during the Jim Crow racial segregation era with Davis and Beauregard in attendance, and also two daughters of General Lee. The monument was placed in what once was Tivoli Circle or Place du Tivoli. New Orleans only spent 15 months in the Confederacy and spent the majority of the Civil War under Union control when the city was captured in 1862 with zero casualties and Tivoli Circle was used as a camp for Union soldiers during the war. A woman was allegedly attacked after workers took down the Confederate Robert E. Lee statue, erected in 1884 by ex-Confederates and white Southerners, in New Orleans, La. Friday, May 19, 2017. The New Orleans City Council voted to remove the statue 16 months ago in Dec. 2015 and three other monuments that have already been removed including a statue of Confederate Jefferson Davis, Confederate P.G.T. Beauregard, and the white supremacist Battle of Liberty Place White League monument. The Lee statue was first unveiled during the Jim Crow racial segregation era with Davis and Beauregard in attendance, and also two daughters of General Lee. The monument was placed in what once was Tivoli Circle or Place du Tivoli. New Orleans only spent 15 months in the Confederacy and spent the majority of the Civil War under Union control when the city was captured in 1862 with zero casualties and Tivoli Circle was used as a camp for Union soldiers during the war.